Some things never change. The only constant is change. The Post Road looks much as it does today. There’s traffic, stores, even the same trees, buildings and vistas. But back when this photo was taken, the Post Road was called State Street. The shops and automobiles were different. Since 1999, of course, that property has been Restoration Hardware. That may change too. Word on the street — State, Post Road, US 1, whatever you call it — is that the upscale home furnishings shop is slated to close. If that rumor is true, I’ve got the perfect tenant. The Westport Cinema Initiative could convert it into — ta da! — a movie theater. This entry was posted in Downtown, Entertainment, Friday Flashback, Local business and tagged Fine Arts Theater, Post Road, Westport Cinema Initiative. Bookmark the permalink. At the risk of being picky – Not sure the trees are the same. Pretty sure the trees overhanging the Photoplay are Elms. Not too many of those around these days. How about a combination of movie theatre/concert space/live talk venue. Then I could do Stand Up comedy there! If I were the developer, I’d take a look at the Community Theater, in Fairfield, before I sank any money into a movie theater. It went belly up and is an eye sore in downtown Fairfield. Let’s have an idea contest on 06880 for ideas better suited for the property. Share your ideas. I wonder when the official name changed from Photoplay to Theater. I either didn’t know or forgot that the structure was originally designed to be an opera house. The building was constructed ca. 1900 and continuously functioned as an entertainment venue for approximately 100 years. It first appears on the 1901 Sanborn map, where it is labeled as an opera house. The Westport Herald briefly occupied space in the building in 1910 and by 1923 it housed a movie theater. New partitions at the front of the building were completed by 1931 for the purpose of adding storefronts. The building is listed in town directories as the Fine Arts Building and Fine Arts Theater from 1928 through 1991. It is currently owned by Fine Arts Realty LLC and is occupied by the Restoration Hardware retail store. What a splendid idea! I still can’t believe that a town so closely linked to the arts, doesn’t have a movie theater. It would make downtown even better. Ta-da! The BEST IDEA of all!!! Arnold Gorlick converted the duplex Hoyts Theatre in Madison, CT to the Madison Arts Cinema in 1999 and it has became a significant presence in town. He can be reached at 203-245-8449 and would welcome inquiries. I’m surprised the theater was called “PHOTOPLAY as late as 1935. I’m picking that date because the most recent car in the picture is about 1934 and maybe not brand new (and I’d like to have that little roadster at the right). But nobody called it Photoplay, or Cinema, or Theater. People just said “what’s playing at the Fine Arts?” That’s a great theater name. Really nice roadster convertible and probably has a rumble seat. Two ahead looks like it could be a Ford Model A sedan…..
Westport *had* five theaters. All gone. The Fairfield Community Theater has been vacant for years and the structure is falling into disrepair. I don’t think a movie theater/duplex could generate the revenue that RH did. Maybe the land owner would like to reduce the rent to allow a theater go back into that space. How about subdividing.. tiny movie theater, comedy club, and something else? Unless there is actual documentation found to the contrary, I don’t believe the building was intended to be an Opera House. It has no real back stage area or “fly loft”. By contrast, look at the Westport Country Playhouse. Check with Gordon Joseloff. As for the date of the photo, I would guess 1939 or 40. 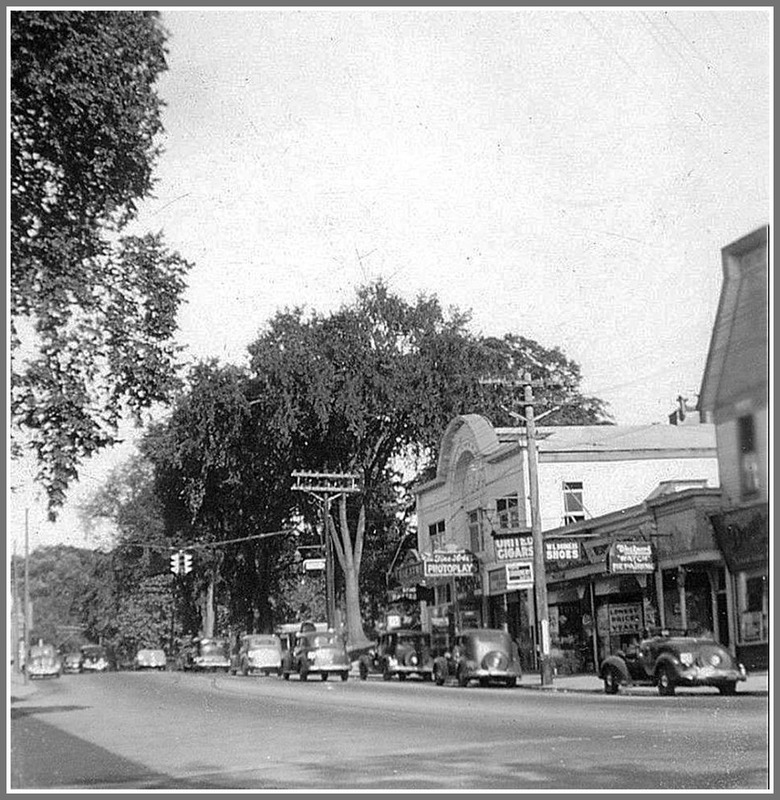 According to local car historian Gordon Green, the newest car in the photo looks to be a ’38 DeSoto facing the camera at the traffic light in front of the WB&T co.The vehicle in front of the theatre appears to be a ’32 Chevy. There are a few ’36&7’s as well. The roadster on the right appears to be a ’35-36 Plymouth. Perhaps there was confusion with the Toquet Opera House a few doors down? Here’s where I found the background information. I suppose anything’s possible and that some of the specifics here could be inaccurate. In fact, I think I might have read elsewhere that the Fine Arts building wasn’t built til the early 1920s. Maybe Gordon does know the complete history.